Please Note: 1) The actual midterm will consist of approximately 60 to 70 questions; there will be true-false, multiple choice, and matching. 2) Most of the questions on the midterm will be very similar to those found in the practice test. True and "b" for false on your Scantron sheet. ____1. Eustatic changes are variations in sea level that can be measured all over the world ocean. ____2. Wave-dominated deltas are usually smaller than river-dominated deltas. ____3. A coastline with an exposed set of marine terraces characterizes a submerged-type coast. ____4. The longer the wavelength, the faster the wave. ____5. An ocean wave will break on the shore when the wave height is ½ of the water depth. ____6. 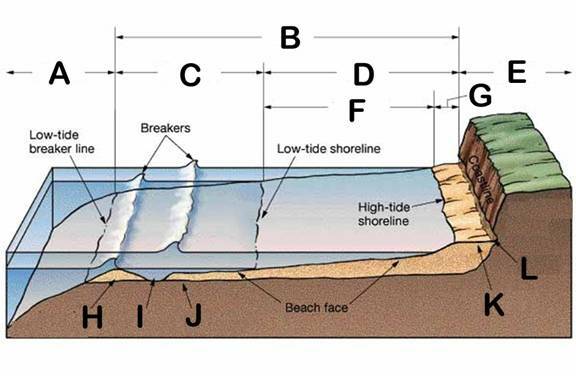 Seawalls are designed to protect the beach. ____7. Jetties are designed to protect the beach. ____8. Beaches, sand spits, tombolos, and barrier islands are depositional coastal features. ____9. Wave-dominated shaping of a coast is characteristic of secondary type coastlines. ____10. Drowned coastal river valley systems are characteristic of a submerged-type coast. ____11. Ocean waves classified as deep-water do not touch the ocean bottom as they traverse the ocean. ____12. An ocean wave is classified as shallow-water if the water depth is less than 1/2 its wavelength. ____13. Beach sand is effectively “trapped” on both side of a groin. ____14. A northwest swell hitting a west coast will create a northward-moving longshore current. ____15. A barrier reef is considered a more mature, evolved reef type than a fringing reef. ____16. All tsunami are considered seismic sea waves. ____17. Rogue waves most likely originate by underwater landslides. ____18. The restoring force for most ocean waves is gravity. ____19. A rip current forms perpendicular to the beach and moves shoreward. ____20. Human attempts to maintain beaches and bluffs is remarkably successful. ____ 1. Which of these lists is arranged in order from smallest wavelength to longest wavelength? seiches, tsunami, wind waves, tides. wind waves, seiches, tsunami, tides. wind waves, tsunami, seiches, tides. tides, seiches, tsunami, wind waves. wind waves, tides, tsunami, seiches. move rapidly toward the shore. do not move: only the wave form moves. move in flat elliptical circles. becomes a back-and-forth motion near the bottom. becomes an up-and-down motion near the bottom. While the wind wave is moving, some water molecules are traveling in closed circles. The wind waves don't move as fast as speeding cannon balls, so Coriolis effect has no influence on them. Wind waves carry only energy, and energy has no mass, and is therefore not subject to Coriolis deflection. Wind waves curve one way in the southern hemisphere and the other way in the northern hemisphere. So waves only look like they are coming in a straight line from their point of origin. It's all a gigantic optical illusion, actually. Wrong! Wind waves are deflected in the same way as everything else that moves on a turning planet. Coriolis effect does not play favorites. miles per hour, or kilometers per hour. occur in shallow water only. form when the wind is blowing less than 0.5 nautical miles per hour. have wave periods of less than one second. the wind tends to flatten the ocean surface. mass transport decreases in the open ocean. the length of time the wind blows. the velocity of the wind. the short waves move out first and form "chop." the short-period waves overtake the long-period waves. the waves are sorted by velocity and form the swell. the sea becomes flat outside the storm area. wave crest forms a steep peak. water depth is about twice the wavelength. crest flattens into a rounded form. wave period increases to 15 seconds. water depth is about four-thirds the wave height. the waves will form seiches. a surf beat will form. movements of large fish or marine mammals. subsea volcanoes or vigorous hydrothermal vents. energy from wind waves or tides moving into deeper water. movements of the Earth's crustal plates. the highest waves of a tsunami. a strong rocking motion within a harbor. a single massive wave that develops in the open ocean. an occasional wave greater than any noted before or after its occurrence. every seventh wave (or every ninth, or sixth, etc.) to be larger or smaller than those preceding or following. waves 100 meters down the beach to be larger than waves where you are standing. When you go down there to enter the water for surfing, the waves where you were get big again. many lives were lost when it struck the shore. it is the largest wave ever observed by people. it is the largest wave accurately measured by people. it was captured and brought alive to Woods Hole Oceanographic Institution in 1933. It is preserved there in the WHOI museum. ____ 24. What wave form typically carries the greatest amount of energy through the ocean surface at any given time? ____ 26. A spring tide is higher than a neap tide, and only occurs during the spring and summer months in each hemisphere. ____ 28. Which body has the most profound influence on ocean tides? All of the bodies listed have an equal influence. tidal currents in the open sea. are giant breaking waves that are dangerous to ships. are slow-moving waves, slower than the swell. are long-period waves, often of 15-20 minutes. have short wavelengths of 100-200 feet, similar to wind waves. the wave height is increased by entry into shallow water. it always arrives at the time of a high tide. the wave will appear as a single huge breaking wave. it will always race hundreds of meters inland. on a shallow beach at the edge of the Pacific. in a harbor or lake. near tropical islands in the Pacific or Atlantic. a single massive wave that suddenly develops and disappears in the open ocean. wind and storms at sea. the gravitational attraction of the moon and the sun. the gravitational attraction of Mars and Venus. the rotation of the moon on its axis. elliptical orbits of the moon and Earth. size, shape, and depth of the ocean basin. time of no tidal action. tide that cannot be predicted. gravitational attraction will be less. difference between high and low tides will be minimal. arrival of high tide will be delayed. highest high and lowest low tides will occur. sea level of spring tides. in rivers or long narrow bays. in open ocean far from land. in enclosed basins such as the Mediterranean. a "no tide" point in the ocean around which the tide crest rotates through one tidal cycle. a place in the ocean where tides are highest. a place in the ocean where tidal datum is displaced to the right (in the northern hemisphere), or to the south (in the southern hemisphere). a "no tide" point at the coast where there is a daily high tide, but no low tide. are responsible for the tides. cause water to flow away from some ocean areas. cause water to flow toward some ocean areas. are influence ocean and atmosphere. ____ 46. Tsunami have historically posed little threat to human life. regular phenomena generated by global winds. associated with all atmospheric storms. air currents caused by the tides. associated with the onshore arrival of a powerful cyclonic storm. interesting but not dangerous to life and property. geologically stable zones separating land and sea. features of great geological antiquity. a dynamic environment affected by both long-term and short-term cycles. that part of the marine environment most resistant to change. the sea froze even in the tropics. sea level was lowered about 120 meters (400 feet) during maximum advances of the ice. the dinosaurs in the ocean were finally killed off by the cold water. most of the continents were flooded as the sea expanded inland. alternate freezing and thawing of coastal cliffs. ____ 52. Eustatic changes are variations in sea level that can be measured all over the world ocean. shore face, or beach scarp. the longshore current, a current that moves sand north-to-south along the coast, parallel to shore, at a great distance away from land. the longshore current, a current that moves sand south-to-north along the coast, parallel to shore, at a great distance away from land. the longshore current, a current that moves sand north-to-south along the coast, parallel to shore, close to shore. the longshore current, a current that moves sand south-to-north along the coast, parallel to shore, close to shore. the longshore current, a current that moves sand on and off the shores, perpendicular to the coastline, only during large storm waves. major surface currents, such as the Gulf Stream. wind waves approaching the beach front at an angle. covered with boulders and cobbles. broad and covered with sand. to build out points of land. to erode and deepen bays. to remove sand from the beach. the type of sand found on the beach. the physical processes shaping the coasts. the direction the coast faces. the latitude in which the coast resides. erosion of local coastal cliffs. currents from the deep ocean floor. excess sand being deposited around seaside installations. the rapid growth of deltas at the mouths of rivers. the development of barrier beaches across harbors. the loss of sand and the erosion of beaches. building of dams across the rivers carrying sediment to the shore. construction of jetties along the beach. placement of seawalls along the shoreline. building artificial breakwater that slow the longshore current system. a beach facing into Arctic storms. generally small waves winter and summer. high-energy waves all year around. wave erosion as the dominant process. ____ 71. If a river delta is to grow in size, _________ must exceed __________. primary process ... secondary processes. secondary processes ... primary processes. eustatic processes ... tectonic processes. ____ 72. Wave-dominated deltas are usually smaller than river-dominated deltas. ____ 75. Of the following statements, which does not apply to coral animals? They are carnivores with stinging cells. They have a medusa body form. They build skeletal structures of calcium carbonate. is made up exclusively of various species of coral polyps. is limited to carnivorous animals. lies within the kelp forest habitat of the tropics. is made up of filter and suspension feeders living off the abundant plankton. is made up of various plants and animals, including primary producers, herbivores, and carnivores. provide carbon dioxide and phosphates for the polyps. feed on the tissues of the polyps and are dangerous parasites. are the main cause of coral bleaching, and are threatening the reefs of the world. provide additional nourishment and oxygen to the polyps. of deep water below 200 meters (660 feet). of cold water or in cold currents. where the water has normal or slightly elevated salinity. near rivers of stream deltas. of low sunlight because they need shade to grow. extreme competition for food, territory, and reproductive opportunities. very few species, but large numbers of each species. large adults in each species that reproduce late in life. organisms with extremely long lifespans. ____ 81. Enclosed lagoon, no land protruding. ____ 82. Close to shore, not separated from land. ____ 83. Separated from land by a lagoon. ____ 84. Found above 30°N or below 30°S latitudes. A drop in sea level. A lowering of the ocean floor. A rising of the ocean floor. A steady relationship between sea level and ocean floor. ____ 86. The average rate of growth of a coral reef is about ______ per year. more than one foot per year. a granite-like substance derived from sima. any of these -- it depends on temperature, salinity, and coral species. ____ 88. Of the following statements, which does not apply to tsunami? They move at speeds near 700 km per hour. Their wavelengths range form 100 to 400 kilometers. They are shallow water waves. Their form changing drastically when they approach shore. ____ 89. The beaches of San Diego get most of their sand from which primary source? Trucked in from sediment quarries. River sediment from the backcountry. Pumped onto the beach via human dredging activities. the Earth’s rotation beneath the tidal bulges. 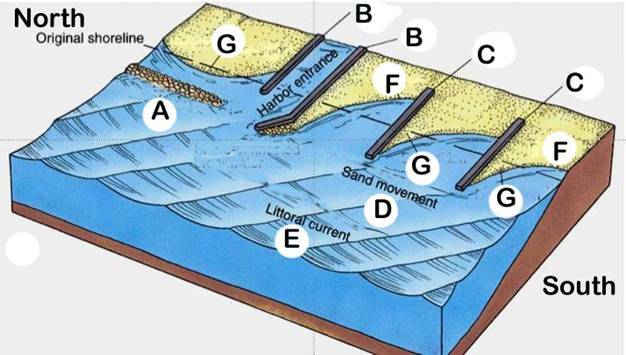 rotation of the tidal bulges over the Earth’s ocean bottoms. protect property behind the seawall from wave erosion. protect the wildlife found along the bluffs. improve the aesthetic appearance of our coastline. dam local rivers and streams. ____ 92. Which of the following features does San Diego’s coast have? a coast having both erosional and depositional characteristics. the West coast is an active margin, and the East coast is a passive margin. the West coast is a passive margin, and the East coast is an active margin. the West coast is influenced by an eastern boundary current, whereas the East coast is influenced by a western boundary current. the West coast is influenced by a western boundary current, whereas the East coast is influenced by an eastern boundary current..
Hey, wait a minute…they are actually pretty similar. swim aggressively straight toward shore. start to wave your arms, and shout for help. just relax and let yourself be taken out to sea. swim parallel to the shore until you are out of the rip current. swim for the bottom where the current is weakest. the seasonal difference in the wave action and storm activity. the change in water temperature. the number of people on the beach. the change in the types of sea life. the seasonal changes of the tides. the alignment of all the planets with Earth. Directions: Match each specified geographic Feature or Process (Capital Letter) with its associated definition or description and/or intended purpose (small-case letter(s)). Directions: Match the shoreline region/feature (Capital Letter) with its associated name or term (small-case letter(s)). Note: For answers with two letters, bubble in two letters as a single answer.